President Trump, who constantly reminds us of his zest for winning, is about to embark on a campaign blitz. He will visit eight states and his campaign will spend millions on advertising. This will begin on Wednesday and last until election day. The result of the Trump campaign blitz will be big wins for the Republicans on election day. The GOP will maintain a majority in the House of Representatives and increase their majority in the Senate to 56 or 57, but perhaps as high as 60. There are a number of reasons why the Democrats will again perform poorly in Congressional elections, but the main reason will be simple. During the 1992 presidential election, Candidate Bill Clinton asked advisor James Carville about the most important campaign issue. Carville answered “It’s the economy.” Clinton focused his message accordingly and won the election. After nearly two decades of slow economic growth, it’s clearly the economy. And voters today are feeling much better financially. The economy is strong, their take home pay has increased and they generally feel optimistic about the future. 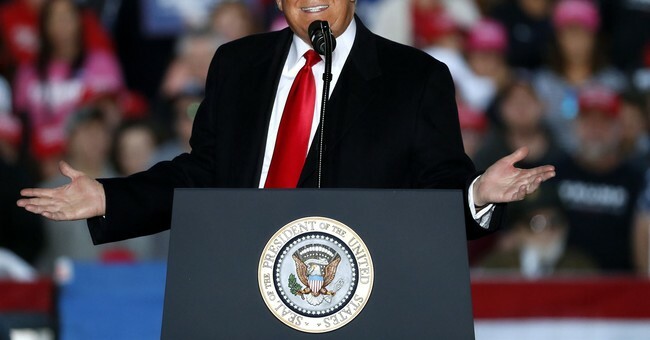 Trump and the GOP candidates will emphasize a simple question, “Are you better or worse off today than you were two years ago?” If you are better off then keep the momentum going and vote for the Republican. There will be a few other themes to Trump’s final message. He will talk about the tax cut that has been very successful in stimulating economic growth in the short term and will be even more successful in the future. The tax cuts have already led to an increase in business investment, which leads to longer term growth. Trump will emphasize that Democratic control of Congress will stop any future growth-stimulating tax cuts and may even result in rolling some back. Trump will tout how the tax cut and the elimination of growth-stifling regulations have already brought prosperity back to the US. What is most important to most people is a good job. Since unemployment is at historical lows in virtually every category, formerly discouraged workers are now finding opportunity. Under-employed college graduates who settled for a job not necessarily requiring a degree, are now finding positions that match their skills and their anticipated income level. Most Americans do feel much better off today than they did two years ago. Trump’s message will resonate. He will also remind Americans that Democrats vote nearly 100% by the party line. That means any Democrat elected will likely never support any of Trump’s positive agenda. During Trump’s blitz, a caravan of thousands of refugees and perhaps hundreds of undesirables will be marching toward the US from Central America. They intend to simply walk into the county, get apprehended and then released. Trump has taken a strong position and says that the caravan of people will not enter the US. Polls consistently show that the majority of Americans oppose open borders and sanctuary cities. There are, however, a few states that take a different view. As a result, the caravan wants to end up in California where Governor Brown will use taxpayer money to support them. Trump will hammer on this issue. The Democrats want open borders and sanctuary cities, while the majority of Americans do not. This issue will produce positive results for Republicans. He will also talk about healthcare, which the Democrats view as a strong point for their party. But Trump will remind voters of the broken promises of Obamacare, the ever increasing cost and the complete inefficiency of the government run option. Socialism is a recipe for failure. Government-run healthcare would be a disaster is the theme that Trump will push. Besides, he will note, with a strong majority in both the House and the Senate, he will be able to permanently fix the healthcare system. He will also remind Americans about how much safer the country is today than it was two years ago. He will also talk about how he has been draining the swamp in Washington. Voting Democratic is voting to bring the swamp back. By election day, undecided voters will vote heavily Republican. Even though there will be strong turnout from both the Democrats and the Republicans, the undecided will swing to the GOP. President Trump will have a Congress that will be more willing to work with him. He will accomplish even more in the next two years than he has in the last two. Trump said he would Make America Great Again. After these elections he should be able to continue.